TimeViewer is one of the best remote desktop software that makes it possible for remote desktop connection between two computers. 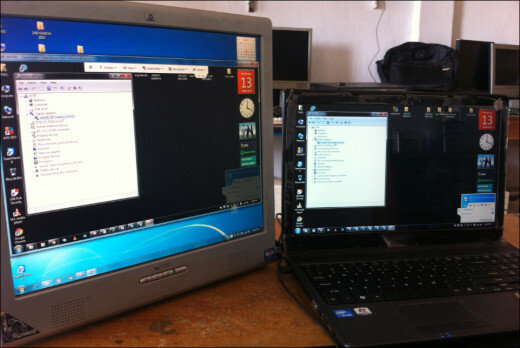 Remote desktop access makes it possible for users to connect computers and permit online assignments and interaction to take place. One user with expertise a field can offer remote assistance to a user that needs related service. This voids the need to have people move around. It also makes it possible for remote users to exchange files right where they are. An important factor to remember is that TeamViewer comes free for personal and non-commercial use, and is available for a fee when used for commercial reasons. TeamViewer allows for online technical support in expediting basic computer troubleshooting, assignments that can be performed as wells by technical personnel or just friends. The two computers can be in one location or can be thousands of miles apart. For example, one computer could be located in New York and another in Kampala. 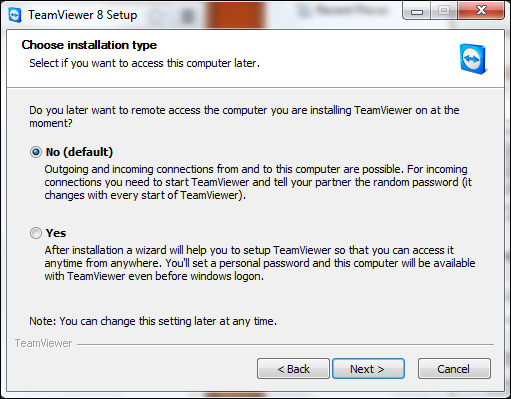 NOTE: Use the following instructions to download and install TeamViewer in the two computers. You should then run TeamViewer setup. A new window will pop up (see image below) where you will have two options: Install and Run. Click Install in order to have TeamViewer install fully in your computer, and then click Next. In the next window, you will have two options which add up to three. 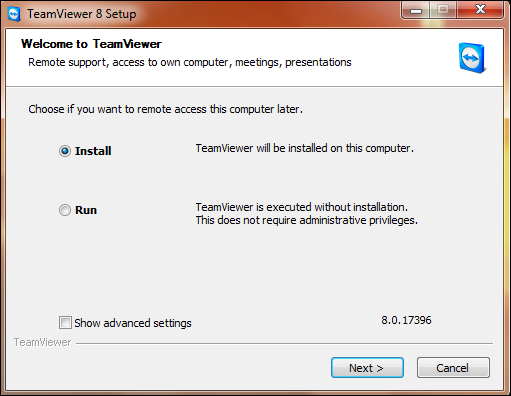 Choose Personal or Non Commercial Use, in order to install TeamViewer for free. The other options mean that you install TeamViewer for Company or commercial. 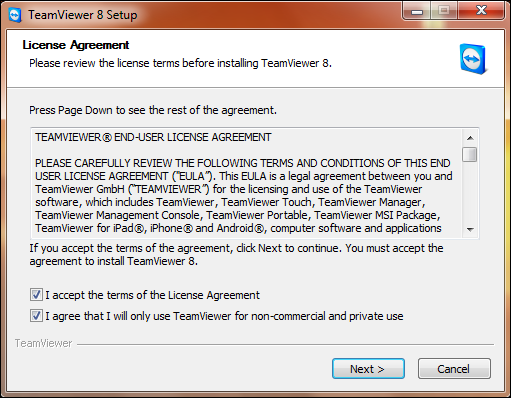 The last option lets you install TeamViewer for free and for commercial use. Check the two boxes and then click Next. In the next window you will have to choose an installation type. 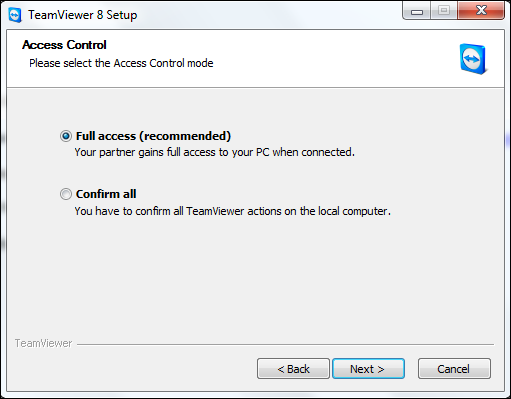 Default installation is the normal installation, permitting remote access to a computer only when TeamViewer is running. 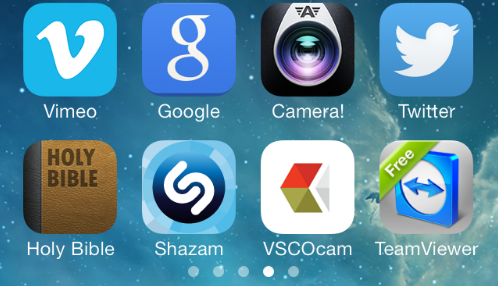 The Yes option grants you or another remoter user absolute permissions. You will have to set up this type of connectivity later on. We shall however go with the default installation which is No (Default). You will then be directed to another window where you will choose to grant full access or grant individual item access. For this article, we shall choose Full Access. Select this option and click Next. 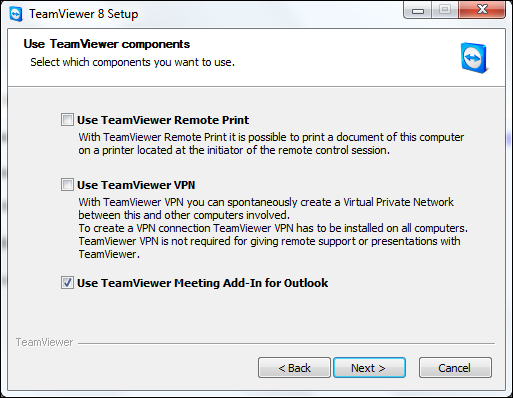 The next window will provide a number of options for your installation: You may choose to install TeamViewer with print, VPN and meeting support for Outlook, or you can choose not to install any of them. Click Next and the setup process will install files in your computer. After the installation of Teamviewer remote desktop software is complete, it is now time to prepare your computers for remote desktop access. In any one single session, one of the two computers will become the host and the other the guest. The computer being accessed remotely is the host computer. The computer which is used to access the other is referred to as guest computer. Typically, the one that seeks remote assistance is the owner of the host computer, and the one that provides remote assistance is the guest. All basic activities and communication can achieved via Remote Control and when you need to run multiple audio and/or access with multiple individuals, you can opt for the Meetings tab. During access setup, the details shown under Allow Remote Control of host computer: Your ID and Password, are what will be entered in the Partner ID space under Control Remote Computer of the guest computer. The image above is TeamViewer on guest computer. It has the ID of the host computer entered in the fill-in box for Partner ID. The above image belongs to the host computer, whose Your ID figures have to be entered in the Partner ID fill-in box in the guest computer. (see guest computer details in the previous image). After the ID has been entered in the box provided, the guest can go ahead and click Connect to partner. A new window will pop up asking for the password. Enter the figures provided under Password in the host computer. In the example above, the password is 2825. 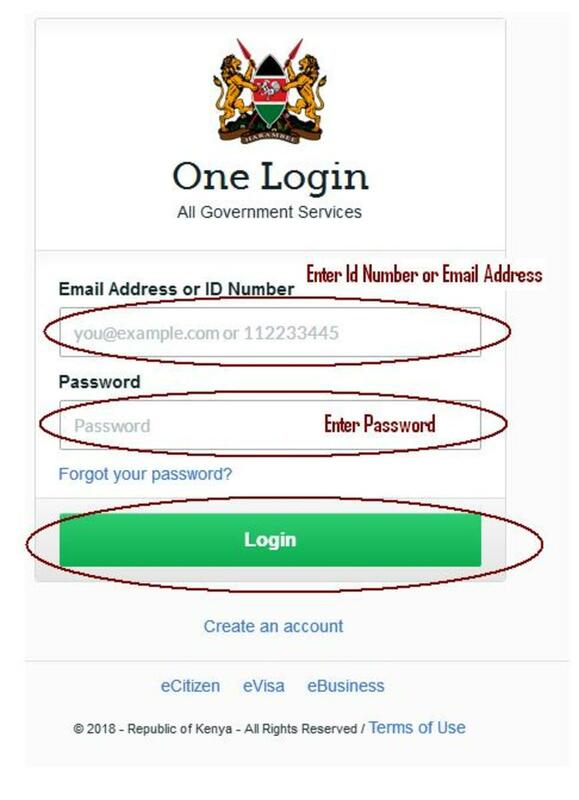 Click Log On as shown below. The roles of either computer can also be swapped. This means that the guest can assume the role of the host and the host can assume the role of the guest and thus provide remote assistance. Share tasks. For example typing and related assignments can be done simultaneously by remote computer users. Remote users can use voice and video communications for various purposes. Files can be shared remotely. Meetings can be done simultaneously from different remote locations. TeamViewer remote desktop software supports up to 25 remote attendees. Do you think Remote Desktop assistance is important enough? 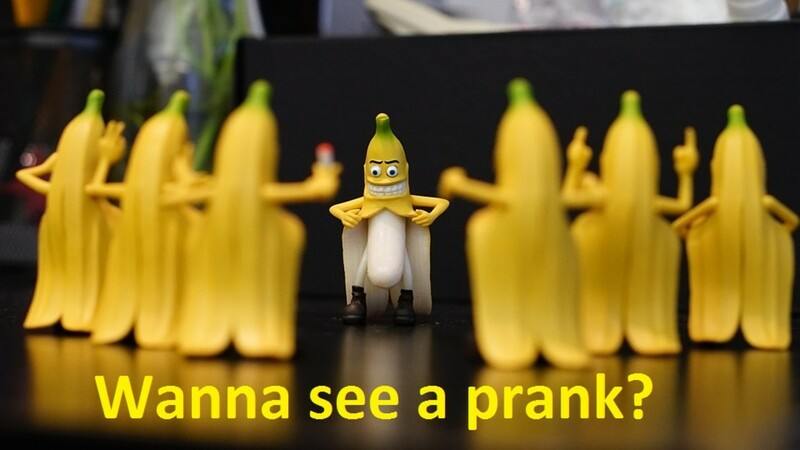 It's good you try it Bizna. I use it quite often to troubleshoot basic problems for my customers. I agree with you. Just used it about an hour ago to have something fixed for me by an expert. Its quite simple and saves time.